Well, way to bring on tears and goosebumps! It's Nana's birthday and the family have gathered to celebrate. Our little curly-haired poppet, Nana's grandchild, narrates the story. She notices that the lines on Nana's face make her sometimes look sad or worried. So she asks her about them. 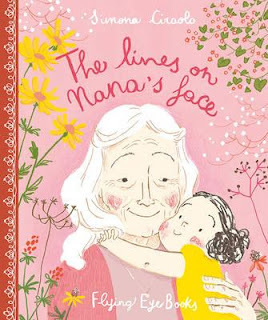 Nana tells her that each and every line on her face is where she keeps her memories. Like the time, as a girl, she discovered and great mystery. Or the time she had the best beach picnic in the world with her girlfriends. Or the time she met ... her little granddaughter. Each of these memories is featured across a lustrous, poignant, wordless double page spread that's sure to evoke curiosity and smiles from kids, and strong emotion (and loads of goosebumps) from adults. This is a book about life--about love--about the spritely joy of being young, and the tenderness and deep wisdom of aging. It's so wonderful to see a book on grandparents that sits outside the square. Grandparents are (or should be) an enormously important part of their grandchildren's lives--and Simona's beautiful book celebrates that. Her illustrations are divinely coloured and deliciously emotive--with touching details and beautifully-conceived content that make you feel like you're living Nana's life alongside her. I particularly love the wedding dress scene, and where she says goodbye to a daughter, as she leaves home.